I hate having to try and find all the different freeze dried coffee items that many recipes call for... this has lead to the quest for taking those recipes and finding how to alter them using coffee not just brewed by also coffee grounds to make the best cookies, brownies,etc. Hope you enjoy the recipes! 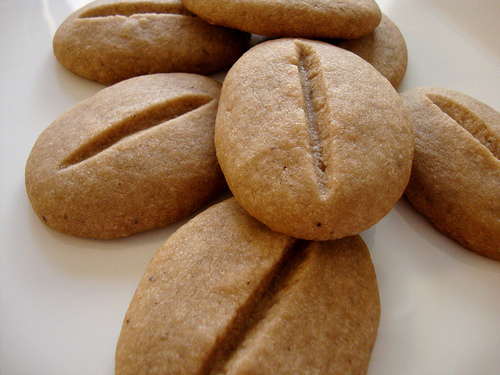 Coffee Bean Cookies without icing. In the microwave heat milk with espresso grounds for 15 seconds to get best coffee flavor. Mix softened butter, cream cheese, brown sugar and vanilla in mixer until smooth. Add in milk mixture and then slowly add in flour. Once everything is combined put dough into refrigerator for at least 30 minutes. Use a spoon to scoop out dough in a consistent size. Roll into an oval shape with your hands and then using the handle of a small coffee cup create a crease down the middle of the cookie. If you find that your handle is sticking in the dough dip it in sugar. Once the cookies are completely cooled they are ready to eat! If you want more coffee taste or a sweeter cookie, which I prefer, make the icing recipe above. Start with the powdered sugar and 1 shot of espresso. If you like chocolate you can add in cocoa powder to make it a mocha frosting. Use a spoon or use a sandwich bag with an end cut off to drizzle over the cookies. The frosting will need to sit at room temperature for about 30 minutes to an hour to harden the frosting (time depends on room temperature). These turned out pretty cute. I think mine suffered a little in the flavour department because my best excuse for espresso was just Disney blend coffee, so I ended up using the glaze after all, with the cocoa - which in turn made them shiny brown like ACTUAL COFFEE BEANS OR SOMETHING and also more tasty. I halved the glaze recipe and still had a lot left over though, word of warning.